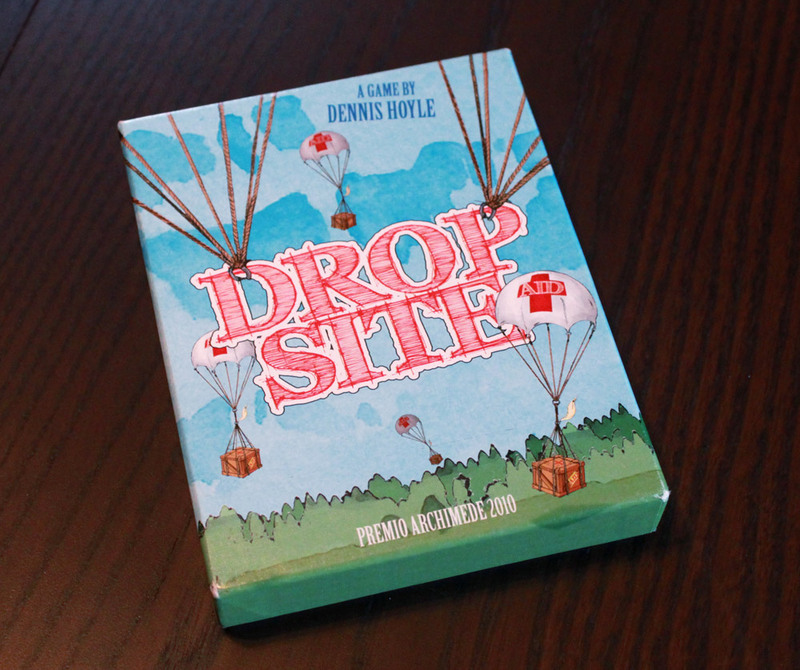 Since @Futurewolfie is gone, it seems like the perfect time to review Drop Site, a card game I ordered from the newly formed Bellwether Games. The idea behind the game is that each player is trying to coordinate efforts to deliver humanitarian aid to those who need it. The theme, I’ll admit, didn’t excite me very much. But as I’ve mentioned elsewhere, theme is very low on my priority list for what makes a great game, and Drop Site, I feel compelled to say, is a great game. The box is compact, making Drop Site easy to take with you wherever you’re going. But the game itself, outside its components, is also compact. The rules are simple: on your turn, you must play a card, either on a drop site, starting a new drop site, or placing it face-down in your debt pile. Then you take a new card. Simple, right? But within this single choice of where to play one of your cards, there is surprising depth and tactical choice. The cards are numbered 0-12, and in order to play a card on a drop site, you must play a lower-numbered card (so, for example, 0-11 can be played on a 12; only 0-3 can be played on a 4, and so on). Your goal in the game is to match cards in your debt pile with the last card played on the various sites when the round ends. (The round ends when a certain number of drop sites have been formed, dependent on the number of players.) Thus, it’s easier to secure points for lower-numbered cards because fewer cards can be used to cover them up. It’s harder to secure points for the higher-numbered cards because there are more cards that can be used to cover them up. Because of this, each card has a point value on the bottom of the card (the number with a plus sign), with more points awarded for higher-numbered cards. At the end of the round, each player reveals his debt pile and scores the point value along the bottom of the card for each drop site that matches that number (there are four of each number in the deck). Each player loses two points for each card in his debt pile that does not match the lowest-numbered card on a drop site. Each player totals his points, and play continues in rounds until one player has 100 points. I love the novelty of this game. It doesn’t seem super interactive, but the interaction is very subtle. When should I play cards that I want to remain on the drop sites? How do I know when to cover up what an opponent plays? Should I play quickly, starting new drop sites often, or should I focus on what’s out there? There’s a lot of bluffing involved because you don’t want your opponent(s) to know which cards you care about and which you don’t. I also love the memory aspect of the debt pile. Players are not allowed to look at the cards in their debt piles until the round is over, and sometimes I’m surprised by the things I put in there. It seems like it wouldn’t be hard to remember the few cards you place there, but it’s hard when you’re trying to bluff your opponent and protect your interests. Drop Site probably won’t be for everyone. What theme is there isn’t essential to the game (though the artwork is quite nice–a colored-pencil style), and there aren’t lots of neat components. But if you’re looking for a compact, fast, and cheap game, and if you love card games in general, Drop Site is novel and fun. It’s hard to play just one game once you get going, and I anticipate this one will be brought out a lot. Previous ArticleFriday Question: What Is a Good Family Game? This sounds a lot like Skip-bo (a theme-less game more akin to Uno). The debt pile begin used to calculate points is different, but it still sounds like a similar feel.